Street noise or aircraft noise, loud music, screaming people – rescue operations generally take place in stressful environmental conditions. 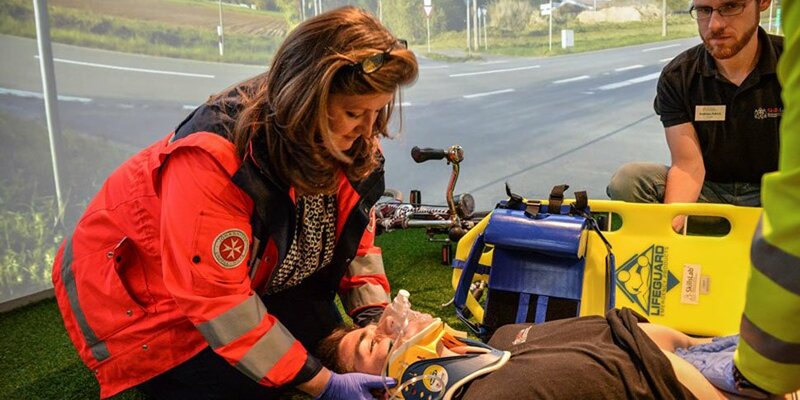 In order to train for such situations, a simulation arena was now installed at the University of Duisburg-Essen. The system consists of a cylindrical screen curved by 270° on which realistic rescue scenarios can be projected. The immersion into the artificial environment is strengthened by real sound effects. Under the thereby created stressful situations the students must check vital body functions and check the monitoring devices. The simulation arena was developed and installed by Virtalis GmbH. For the projection the projector auto alignment technology of Fraunhofer FOKUS was deployed by which the pictures of the individual projectors are accurately and automatically put together into one homogeneous picture. This encompasses the geometric correction (warping), automatic brightness control (soft-edge-blending) and camera based auto calibration. In addition FOKUS developed the recording workflow for the creation of the 360° films and the software for the interactive surround sound output.